So I set out to make healthy donuts my kids would love. First, I looked for recipes I could fry, with visions of sourdough-raised Krispy Kreme copycats dancing in my head. No dice. In fact, the dice laughed at me, it was such a tall order. Then I started looking at cake donuts. I realized after a little surfing that cake donuts are basically dense muffin batters baked into the donut shape. So I pulled out my favorite muffin recipe and did a little fiddling with the ingredients to make them dense and rich with extra fat. I then set out to find a suitable pan. After surfing a while and only finding non-stick pans and ideas involving aluminum foil, I did turn up a silicone pan on Amazon that was the right shape. Then a lightbulb went off. 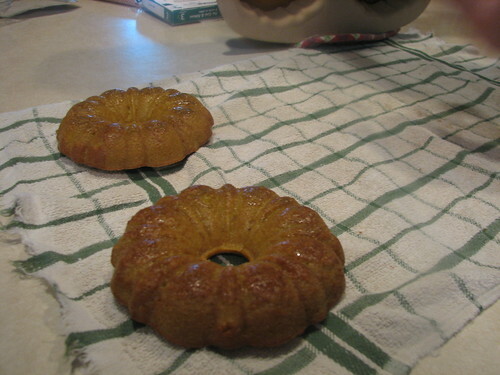 I own the mini bundt pan that had been retired from Pampered Chef. Most donut pans have 2-3″ diameters, and this pan is 4.5″ diameter across the top, but I felt sure it would do in a pinch while I tested it out. So I made the batter, greased the stoneware extremely well with melted coconut oil, and poured it into the pan to just below the middle divet-thingie. I popped it into the preheated oven. I kept having to shoo the kids away from the stove, they would sneak over and turn on the oven light, peering through the door. To them, it was better than TV. I glazed the donuts with a simple glaze. The results got thumbs up all around, and the kids are asking when I can make donuts again! Hubby said one of the major donut makers in the US does a donut with a similar pattern, so I guess if we took them somewhere, like to a birthday party, people might not look at them funny. Voila, healthy donuts! Sneaky, sneaky! All photography was provided by my daughter. She grabbed the camera to help out, knowing that would get the donuts into her mouth quicker. Smart girl knows the good lookin’ food can’t be eaten until the photographs are uploaded and approved by mom. Of course, I’m not going to tell them that it’s coconut flour and egg-based batter and it’s good for them! Shhhh…… 😉 Now my kids are going to think they’re getting a big treat any time I fix donuts! 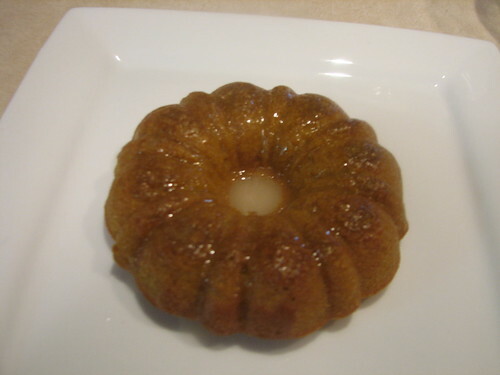 I’ll get the silicone donut pan when I can, but until then, I’ll stick with my mini bundt pan. Disclaimer: I receive no compensation from any of the links that you click in this post. I am not an Amazon Affiliate. When made with stevia, this recipe is a Satisfying recipe if you’re following Trim Healthy Mama or a similar, single-fuel program. Preheat your oven to 350 degrees. Generously grease your pan, if needed, and set aside. In a bowl, sift together the coconut flour, soda and salt. Set aside. In a separate bowl, whisk the rapadura, eggs, milk, extract and oil together. Pour the wet ingredients into the dry ingredients and whisk until smooth. Add a little water, if needed, to get the batter to come together. Pour into the greased pan- I made this easier by transferring the batter to a pyrex measuring cup so I could measure and pour without blobbing the batter all over the little divet-thingie. Jiggle the pan a little to get the batter to level out. Bake for 20-22 minutes, or until a toothpick comes out clean. 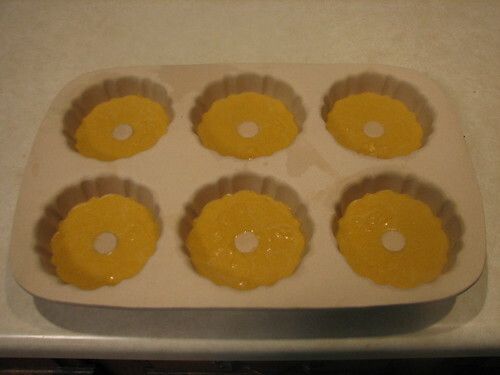 For a traditionally-sized donut pan, the baking time would be reduced to 15-18 minutes. Mix a little coconut milk, a dash of salt, a little vanilla and a small bit of powdered sugar or stevia until smooth. Drizzle a little over each donut. If you decide to try this technique with a different recipe, I’d love to hear how you adapt the batter to make it denser and how it turns out! Shared at Trim Healthy Tuesday. Have you ever tried making these with other gluten-free flours besides coconut? Did they turn out? I haven’t tried it with another flour yet. I’ll post a new recipe if I find a combo that works. Ok I just made them as suggested, and they tasted like egg through and through (like a custard flavor)! I love eggs, but it’s not very doughnutty. I wonder if there’s a way to incorporate another flour to minimize the egg taste. Any ideas? If you incorporate other flours and remove egg as needed, this becomes denser than a cake donut. No good answers on that one yet, I’m still working on it. In this recipe, the egg is providing the leavening and tenderness. I was wondering if it would be possible to omit rapadura or sucanat. I am trying to get away from sweet stuff. I have just found your blog and it is great! I have bookmarked it. Alina, I assume you could do a low-sugar or no-sugar version by replacing the sucanat with liquid stevia. I’d try the same proportions that Bruce Fife gives in his coconut flour recipes for baked goods- 1/4 cup sucanat is equivalent to 30 drops liquid stevia. We limit sucanat to weekends in our household. The kids get one treat each weekend. How creative and what a great idea! I agree, I got all excited about Kinninnick donuts until I saw the ingredients. I follow a grain free diet so all the rice extracts in there wouldn’t work for me. Can’t wait to try these, though. Thanks for sharing! Do you think I can use honey in place of the rapadura? That is exactly my question. We follow the GAPS diet and can’t do the other sweeteners…only honey. Yes, I believe you could. You would need to sweeten it to taste. I’d assume 2.5 Tbs of honey is the right starting point for this recipe. I made this several times this week and have some tweaks 🙂 First, I used a regular non-stick donut pan since that’s all I could find locally. It is the Wilton’s with six donut forms. The first batch I baked for 15 minutes and they were very dry. Second I cooked for 14 and they were better, 3rd I baked for 12 and they were perfect. I used about 2.5-3 Tbsp honey and dd thought they weren’t sweet enough, so in the 2nd batch we tried for a chocolate donut ala your other recipe. I just added a couple spoonfuls of cocoa, 1/4 c honey instead of the sucanat, and a few splashes more milk. Everyone really liked those and they were sweet enough without being overly sweet. They turn out more like a moist cupcake than a heavy cake donut, but we really liked them. I also put a pan in the freezer yesterday morning to see how they would bake up from frozen. I put the still frozen pan in a preheated oven this morning and had to bake them for 18 minutes instead of 12, but they were still perfect. Have you tried to fry these? I’m looking to fry them in TT’s palm oil or pastured lard. I’m following GAPS, so anything with rice flour is out for now. I haven’t tried frying. I’m not sure the batter is firm enough. I think the recipe might need some adjustment before you could fry it. Any suggestions on what to replace the eggs with? I need dairy free. Gina, in this recipe, I know of no way to replace the eggs. However, eggs are not dairy and do not contain any casein protein.